In culinary school our chef instructor insisted on consommé so clear you could read the date on a dime at the bottom of a bowl. He never tossed pocket change into our soup but he did teach us how to transform cloudy stock into a consommé so light and translucent it sparkled — with flavour so pure it can only be described as intense. The process is old-school odd but fascinating: you mix lean meat, in this case ground chicken, with egg whites and stock and bring the mixture to a simmer. Eventually the proteins merge together and rise to the surface of the stock, creating a grey, scary-looking floating mass, called a “raft” in culinary speak. The simmering motion draws the stock’s impurities to the raft, rendering the stock beneath it clear and proving, once again, the ingenuity of the French. If you’re up for a challenge, give it a try and keep the change. You’ll need a fine-mesh sieve lined with cheesecloth and placed over a large saucepan. In a large pot, combine the stock, chicken, egg whites, onions and parsley. Bring the mixture to a simmer over medium-high heat, stirring constantly (to prevent the chicken from sticking to the bottom of the pot). When the stock becomes cloudy and the clarifying ingredients float to the surface and merge together to form a raft, stop stirring and allow the stock to simmer very gently, without disturbing, for about 45 minutes. Using a large spoon or a ladle, carefully poke a hole in the center of the raft without disturbing the entire raft. If the raft collapses and falls back into your stock, well, you’ve learned a very important lesson on what not to do. Carefully ladle the consommé from the pot into the cheesecloth-lined sieve. Discard the raft. Taste the consommé and adjust the seasoning with a pinch of kosher salt if necessary. Serve on it’s own or with blanched thinly sliced vegetables, steamed chicken or dumplings. I first cured salmon at culinary school where I learned to scale, gut and fillet whole fish. If you’ve ever peeled fish scales from your cheeks or plucked them from your hair, you’ll know that scaling fish is a messy job. Fortunately, fresh salmon is readily available scaled and filleted, making the curing process simple even for the most reluctant cook. There are numerous variations for curing salmon but the principles are similar: bury the fish in seasoned salt and sugar, add a few pounds of weight (cans work well) and allow the salt to work its magic. The salt draws the moisture from the fish and transforms its texture; it’s a preservation technique that’s been around long before refrigeration. I’ve flavoured my salt with wispy fennel fronds but you could use dill, parsley or a combination of your favourite herbs. Just stay away from pungent herbs, like rosemary, because they’ll overpower the fish. 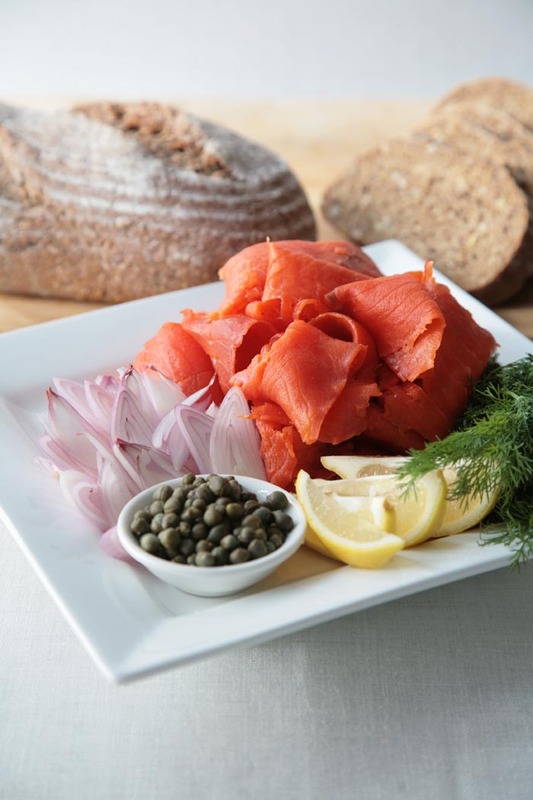 I enjoy cured salmon drizzled with a simple vinaigrette and served with raw shallots, fresh dill, capers, lemon and freshly ground black pepper. Cured salmon keeps for about a week in the fridge, but it never seems to last that long. You’ll need a container large enough to contain the salmon, sugar, salt and herbs. The salmon will release plenty of liquid as it cures, so select a container that will accommodate the additional fluid. Run your fingers over the flesh of the salmon to check for pin bones; remove with tweezers if present. In a large bowl, combine the chopped fennel fronds with the salt, sugar, and crushed fennel seeds. Place half the mixture in a large shallow container. Nestle the salmon on top and cover it with the balance of the mixture. Cover the salmon with plastic wrap and weight it down with a flat object, like a small plastic cutting board, and then with 2-3 cans or other suitable objects weighing about 5 pounds in total. Refrigerate for 24 hours. Remove the salmon from the curing mixture and rinse thoroughly in cool water. You’ll notice that the salmon’s texture has become firm. Pat completely dry with paper towels. Using a sharp knife, slice the salmon thinly at a 45-degree angle, holding a corner of the skin to keep it in place. Discard the skin. Serve with fresh lemon, capers, thinly sliced shallots and freshly ground pepper. If you’re looking for a quick side dish or light lunch, you’ll want to try lentils dressed with a tart Dijon mustard vinaigrette. Toasted walnuts add a nutty crunch and freshly chopped cilantro, or parsley if you prefer, add a light, refreshing note. If I have it on hand, I’ll add a dollop of crème fraîche, sour cream or yogurt. I use Puy lentils because they cook quickly and retrain their shape, rather than breaking down and turing soup-y, like some lentils. 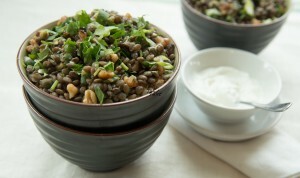 If you can’t find Puy lentils at your local grocer, try Choice Markets, Planet Organic or Whole Foods Markets. Lentils go with just about anything so feel free to tinker with this recipe. Chopped (cooked or raw) vegetables make a lovely addition. Rinse the lentils under cold water and discard any debris. Place the lentils in a medium saucepan and cover with chicken stock. Bring to a boil, reduce the heat to low and cook, partially covered, until cooked through, about 20 – 30 minutes. Add additional stock as necessary to keep the lentils covered. While the lentils are cooking, prepare the vinaigrette: In a small bowl, whisk together the mustard, garlic, capers, salt, vinegar, and anchovies, if using. 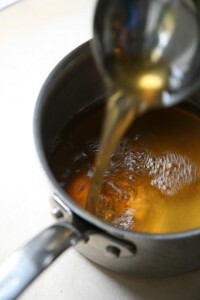 Add the oil in a slow, narrow stream, while continuing to whisk. Alternatively, combine the ingredients in a small, lidded jar and shake well. Taste the dressing and add additional salt, if desired. Transfer the cooked lentils to a large bowl, add the herbs, nuts, bacon, green onions and salt. Toss with about 1/4 cup of the vinaigrette. Taste and adjust seasoning, if necessary, with additional salt. Transfer to a serving bowl and just before serving, top a dollop of crème fraîche. Serve additional vinaigrette on the side. Soufflé: A delicate baked dessert, made of stiffly beaten egg whites, that rises and deflates faster than it takes to sprint from the oven to the table. 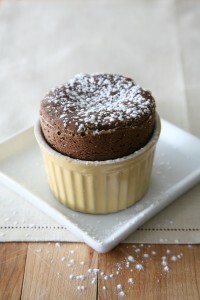 Soufflés wait for no one but chocolate soufflés are more forgiving; more robust than their pale counterparts. So sturdy, in fact, they can be prepared in advance and frozen until they’re ready to bake. And, they’ll hold their shape long enough for your guests to admire, before digging in. 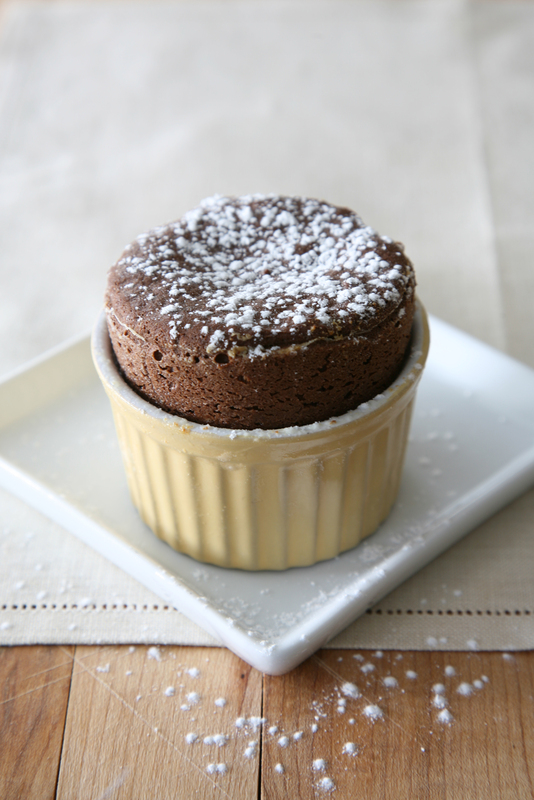 This soufflé come with a chocolate truffle center, an irresistible play of light and airy cut with gooey molten chocolate. You’ll want a freezer full. The recipe is made in two steps; first the chocolate truffle centers, then the cake. It’s helpful, but not necessary, to use a piping bag to portion the chocolate. If you don’t have a piping bag you can fashion your own using a plastic freezer bag. Place chocolate and butter in a medium-sized bowl. Heat the cream in a small saucepan until just boiling. Pour the hot cream over the chocolate and stir until the chocolate and butter have melted and blended. Refrigerate until the chocolate is firm enough to to drop by the spoonful (or pipe through a pastry bag). Place 1 ¼” portions of chocolate (approx. ½” thick) onto the parchment-lined baking sheet. Cover with plastic and set aside in the fridge or freezer until firm. Place a heat-resistant bowl over a saucepan filled with an inch of simmering water. Place the chocolate and butter in the bowl and stir until just melted. Remove from the heat and add the yolks, stirring until well blended and set aside. Whisk the egg whites with the cream of tartar on medium-high speed. Gradually add the sugar in small batches. Increase the speed to high and whisk to a firm glossy peak, being mindful not to over-whip. 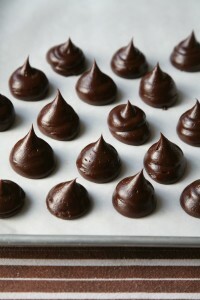 Using a large spatula, gently fold the egg whites into the melted chocolate mixture, in three to four batches. Fold in the flour. Spoon the batter into the ramekens, three-quarters full. Place one of the firmed chocolate in the centre of each pan, pressing gently to ensure batter surrounds each. Bake for 12 – 15 minutes or until a toothpick inserted into the cake’s outer edge, comes out clean. Serve immediately. There’s something special about a pastry you can pick up with your hands. Turnovers are daintier than pie and easier to prepare. Because the filling is precooked, the pastry stays crisp, not soggy. Best of all, turnovers can be made in advance and stored, unbaked, in the fridge until you’re ready to bake them. I’ve served turnovers at room temperature as part of a brunch buffet, and piping hot for desserts with vanilla ice cream. Hot, cold, with or without ice cream, it’s all good. Turnovers can be made with puff pastry, as pictured, or with standard pie dough. In a medium bowl, toss the apples in the lemon juice. In a large sauté pan, over medium heat, melt the butter and add the apples and brown sugar, stirring to coat the apples with the sugar and butter. In about 5 minutes the apples will turn soft; it will take another 15 – 20 minutes for them to turn golden. You will need to turn them every so often to colour them evenly — be gentle, you want nice cubes of apples, not applesauce. The apples will reduce to about half their original size. Taste the apples; if you want your filling sweeter, add a touch more sugar. If you prefer it more tart, add a bit of lemon juice. Cool the apples completely before using. On a floured work surface roll out the pastry to about 1/4” inch. Using a round cookie cutter about 3 ½” to 4” diameter, cut the pastry into 12 rounds. 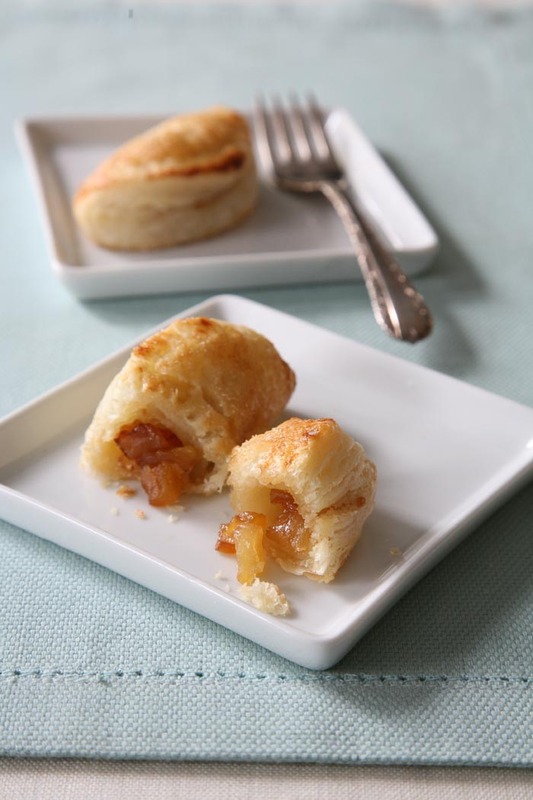 Add to the center of each portion of pastry a generous spoonful of cooled apples. Brush the pastry’s edge with a bit of beaten egg and fold over the dough to create a half circle. Seal the edges, gently with your fingers, then with the tines of a fork. Repeat with the remaining pastry. Cover with plastic wrap and chill until firm, about 30 minutes. Remove the plastic wrap and brush the pastry lightly with the beaten egg and sprinkle with a bit of sugar. Using a sharp knife, score the top of the pastry to create air vents. Place the apple turnovers on a parchment lined baking sheet and bake for about 15 -20 minutes, turning the pan once during baking, until the pastry is golden. These pastries are delicious served at room temperature, but even better served warm with vanilla ice cream.